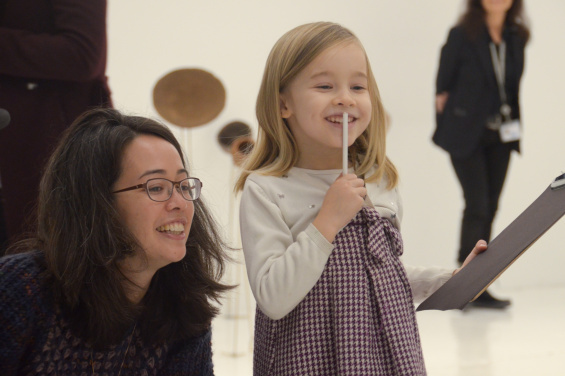 Join us for Family Day presented in conjunction with the exhibition “Alexandra Pirici: Co-natural,” on view at the New Museum from February 6 to April 15, 2018. Pirici’s exhibition uses live performance and a hologram of a performer to consider how presence can be pieced together from both images and physical bodies. As the ongoing performance of movement and voice progresses over the course of each day, bodies disperse and come together in reference to different histories and memories. Families are invited to take turns as choreographers and performers in the Sky Room, reinterpreting images of monuments and works of art. Using their bodies as a medium, families will consider how gestures and interactions can transform space. Support for “Alexandra Pirici: Co-natural” can be viewed here. Thanks to the Mimi Saltzman Foundation.